When Christmastime rolls around, plaid pops up everywhere and I always drool over all of the pretty plaid shirts, shoes, skirts and dresses that are so perfect for the holidays! I also tell myself every year that I own way too many plaid articles of clothing and vow to refrain from adding any more to my collection but then, inevitably, I cave and buy at least a few new pieces! (I literally have a container filled with only plaid shoes!) This year was no different and I was quite weak-willed when it came to plaid! 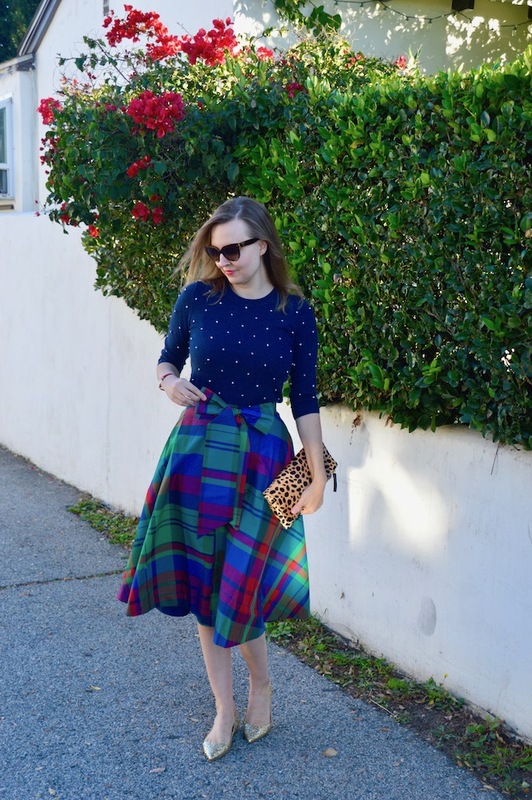 Among other new plaid items, I added this plaid bow skirt from Anthropologie to my collection of plaid skirts, however I'm glad I did because it's just gorgeous! One of the things that I like best about this skirt is the large bow around the waist. If there's one thing that's better than plaid, or at least equal to it in regard to being holiday appropriate, it's bows! This bow is big and certainly makes a statement. Also, the bow makes you feel like your plaid skirt could be a neatly wrapped present, which, again, is just perfect for the holidays! Last of all, I really like the jewel tones found in this particular plaid print. I already have a lot of tartan plaid, which I love, but it's nice to try something different for a change. 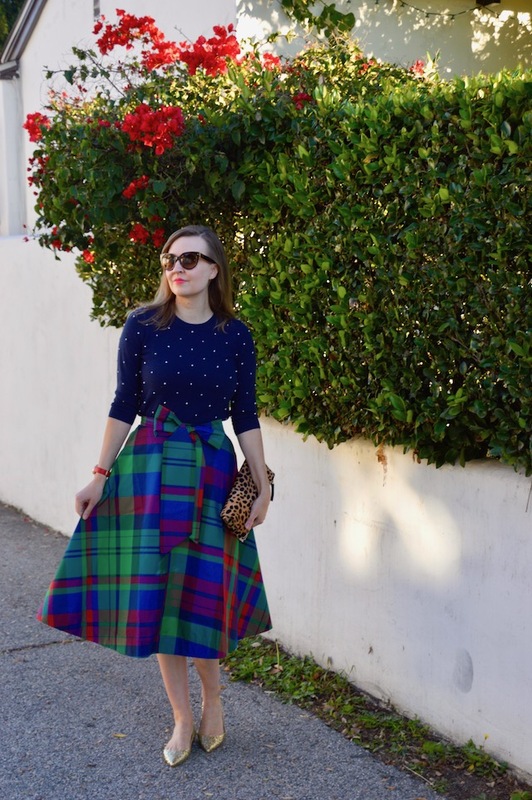 I thought for a little pattern mixing I would add another dimension to my plaid skirt by wearing this dot sweater. Of course, the finishing touch to my outfit is the sparkly gold pair of shoes because, just like plaid and bows, who doesn't love a little sparkle around the holidays? 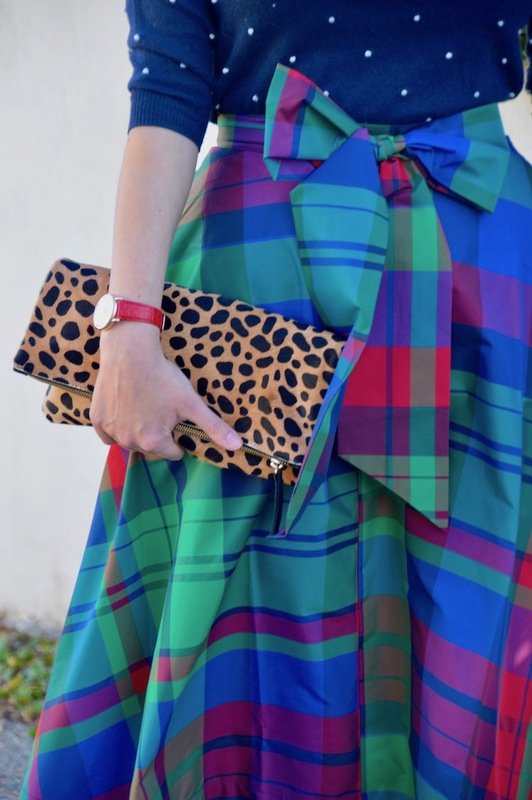 That plaid skirt is beautiful and love the colors! It will be perfect to wear even after the holidays. Of course, you are right about the bow. It is the prettiest detail and the bigger the bow the better! Ah that plaid skirt is so cute! I love the bow and how you styled it with the polka dot top! That is definitely a gorgeous skirt! Love this whole outfit! I'm a jewel-toned girl and this is just gorgeous. Plus, I'm with you 100% - bows and sparkle-shoes are perfect for the holidays!